In that same report, we found that online economic users relied heavily on online sources to make sense of the economic crisis, to adjust their own personal finances, and to share their experiences during the recession with others. This data memo, based on a national telephone survey conducted March 26 to April 19, 2009 among 2,253 Americans (including 561 reached via cell phone), evaluates the flip side of that phenomenon: the degree to which people are using the internet as a diversion and way to relax and take their minds off of their economic troubles. 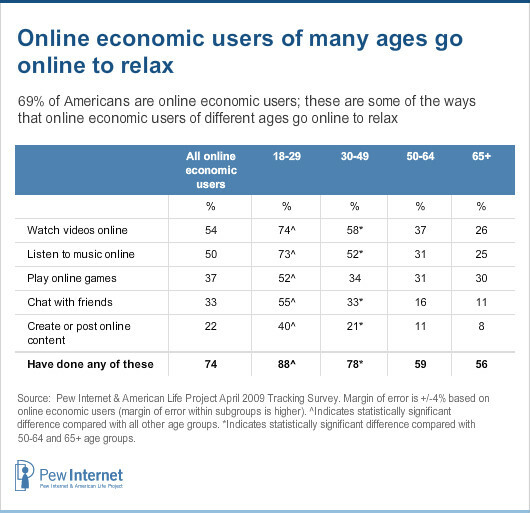 The youngest online economic users (those ages 18-29) are significantly more likely than other age groups to engage in a wide range of online relaxation activities. 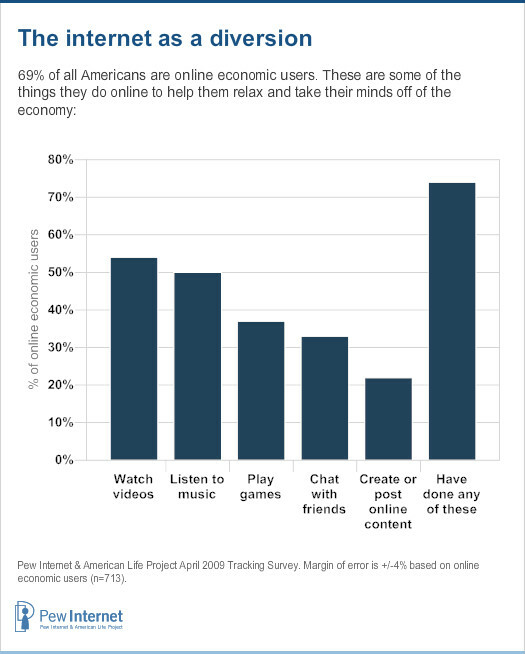 Among these young online economic users, three-quarters say that they go online to relax by watching online videos (74%) or listening to music online (73%); roughly half play online games (52%) or go online to chat with friends (55%); and two in five post their own original creations online. Although the youngest online economic users turn to the internet in the largest numbers to relax and take their minds off of the economy, those in other age groups tend to do so as well. For instance, among online economic users ages 30-49, more than half say they relax by watching online videos (58%) or listening to music online (52%); additionally, one-third play online games (34%) or chat with friends online (33%). There are few statistically significant differences between male and female online economic users. The exception is chatting with friends online: women (38%) are more likely to do this than men (27%). There are also few significant differences between online economic users based on race, education or household income. Going online to relax is a near-universal activity among online economic users, regardless of whether they have been personally impacted by the recession or not. 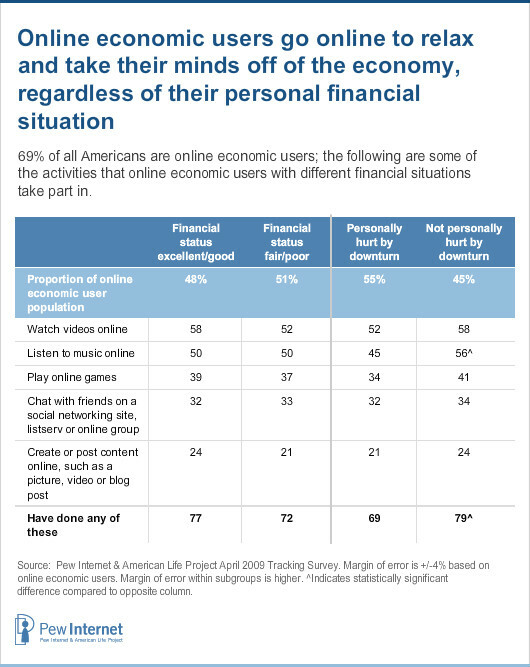 Interestingly, online economic users go online for relaxation or as a diversion at the same rate regardless of their own financial situation, or whether or not they have been personally impacted by the economic downturn. For these online economic users, going online as a diversion or relaxation tool is simply a standard feature of their lives, and not one that is necessarily tied to their personal economic circumstances. 46% of online economic users who go online as a diversion have also gone online to find or use online coupons. 26% have sold personal items on an online auction site. 15% have signed up online for automatic updates about economic or financial issues, and an additional 15% have tagged or categorized online content related to economic or financial issues. 13% have shared photos, videos or audio files about economic or financial issues. These individuals are also active in posting their own original online content: 10% of those who go online as a diversion have posted their comments about the recession in an online discussion group or other online forum, and 9% have done so on a blog (their own or someone else’s).